Everyone dreams about retirement being a happy, healthy time to finally settle down, take time for yourself, travel and count your blessings, but a recent reports suggests that if you want to retire right now in a healthy environment, don't stay in Kentucky. Kentucky ranks 45th in overall health rankings for seniors and last in two measures: total health outcomes for seniors and preventable hospitalizations, says United Health Foundation's America’s Health Rankings Senior Report. Kentucky was next to last in cognition and education of seniors and prevalence of dental visits, and likewise second worst in premature death rate for seniors. The report shows Minnesota at the top of the list, with Vermont and New Hampshire following closely and Mississippi as the least healthy state for older adults. This report aims to point out the health challenges affecting today’s seniors and encourage action that improves communities' overall health. In Kentucky, the report shows community support is low, with total community expenditures at $358 per person aged 65 and older living in poverty, much lower than Minnesota's $542 per capita. Not all of the report's findings about Kentucky were bad; the state is strong in three areas: underweight seniors, activity-limiting arthritis pain and low-care nursing home residents. And, on another positive note, Kentucky ranks 15th in the number of seniors receiving flu vaccines and 10th in pain management for seniors. Determinants that were considered in the state's ranking include behaviors like smoking and dental visits; micro and macro community and environment measures like poverty and social support; policy measures like the state's geriatrician shortfall; and measures of clinical care like home health or hospital care and diabetes management. The health of our state's seniors is critical, especially as baby boomers age. The number of Americans age 65 and older is expected to more than double by 2050, from 40.3 million to 88.5 million, according to the federal Centers for Disease Control and Prevention. 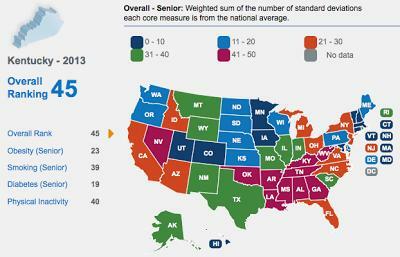 About 13.5 percent of Kentuckians are 65 or older, which is higher than the national average. Considering this, the report generates a provoking question. If our state's seniors are unhealthy, can Kentucky be healthy? Kentucky Health News is an independent news service of the Institute for Rural Journalism and Community Issues, based in the School of Journalism and Telecommunications at the University of Kentucky, with support from the Foundation for a Healthy Kentucky.